Giants and Jason Pierre-Paul Have Not Talked Contract: According to NJ.com and ESPN.com, the New York Giants and representatives of defensive end Jason Pierre-Paul have not begun talking about a new contract. Pierre-Paul is scheduled to become an unrestricted free agent on March 10 (players can actually begin talking to new teams on March 7). Media speculation continues that the Giants will designate Pierre-Paul the team’s Franchise player, which the Giants can do during a two-week period from February 16 to March 2. 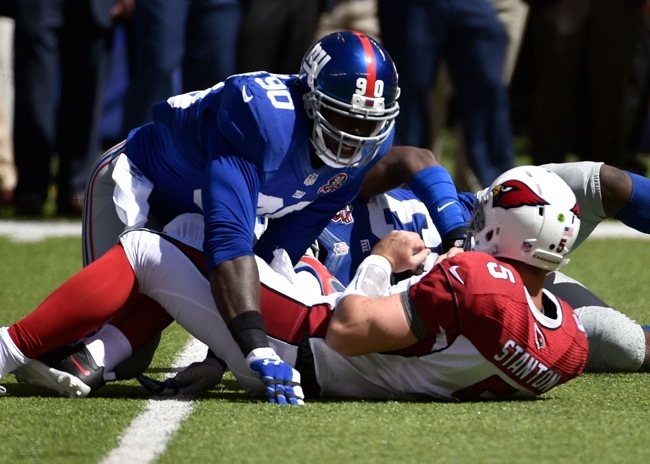 By doing so, Pierre-Paul is all but certain to remain a Giants through the 2015 NFL season. He could play out the year on the near $15 million tender or still possibly sign a long-term deal. Free Agent Rumors: According to ESPN.com, the New York Giants have expressed interest in re-signing soon-to-be unrestricted free agents cornerback Walter Thurmond and defensive tackle Mike Patterson. ESPN.com is also reporting that soon-to-be unrestricted free agent safety Antrel Rolle is looking for a bigger contract than the Giants are willing to offer. “Certainly we would like him to come back. Obviously we do have financial restrictions involved,” said Head Coach Tom Coughlin of Rolle on Thursday. Salary Cap Expected to Be Near $143-145 Million: According to press reports, the 2015 NFL salary cap is expected to be near $143-145 million, which would be a $10-12 million increase over the 2014 NFL salary cap. BBI on CBS Sports Radio (940 AM) on Sunday: BBI’s owner Eric Kennedy will be on CBS Sports Radio’s GameFace this Sunday at 9:20 AM on 940 AM in the NY/CT market and on www.940sportsradio.com. GameFace is America’s longest running, year round, NFL radio show.